Two days ago I made individual Chocolate Molten Lava Cakes. They were a work of art. The picture turned out fabulous. Which is no small feat for me, with no sunlight all winter , and the fact that I am still figuring out how to work my expensive camera. In my early posts I didn’t even know I needed software that reduces the pixels size so that the image loads quickly. So don’t go back and check those early posts, it will be ages before any visuals show up! So why didn’t I post them? Those fabulous little gooey chocolate creations? They were incredibly dry, not gooey and not so yummy as it turns out. Given enough time I can style any food (whether it tastes good, or not) and make it look mouth watering, and worthy of your time in the kitchen. Not going to post it though, unless it is a huge home run, always. I will try again with those darn chocolate cakes, don’t worry. In the meantime our local fishmonger received a big shipment of the freshest, whitest, best tasting halibut ever (his words). So I mixed together a quick cornmeal crust that made it oh so crispy on the outside, yet moist and tender on the inside. The only way my Hubby likes fish is crispy, you may notice a pattern here with the fish posts. So if you ever see “Wine Poached Halibut with Julienne Vegetables” likely the girls were over for dinner, and the Hub was out of town. In my haste to run to the table with that plate, because who likes cold fish?. I forgot to place a nice big dollop of the Spicy Tartar Sauce on top. Sorry about that, it was heavenly. We also had Quinoa with grilled asparagus and spring onions, I added a little lemon zest, and topped it off with a nice drizzle of extra virgin olive oil. Wash and pat dry halibut. In a large shallow bowl mix cornmeal, flour, spices. In another large shallot bowl beat the egg add hot sauce. Place large cast iron skillet with olive oil over high heat. Dredge fish through egg mixture then roll in cornmeal mixture. When oil is so hot you might set the stove on fire( not really but almost), carefully add the fish. Cook until underside is nicely browned and crispy. 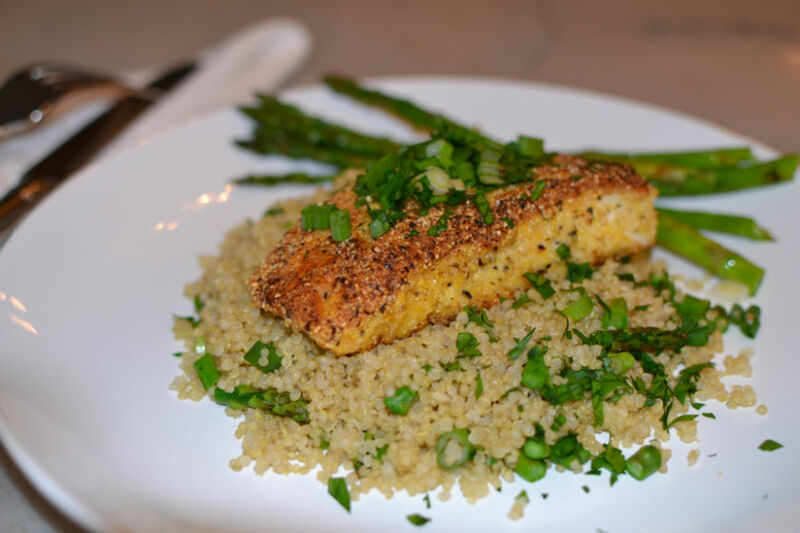 Flip over fish, place skillet in preheated oven for 10-12 minutes, depending on the thickness of your fish.. Remove from oven and serve with Tartar Sauce. Love, Love, Love your blog. It’s like getting a present when your post arrives in my inbox. The photos are awesome and the food is divine. Have made the quinoa falafel four times already. I make a big batch so the kids can take them for lunch. My husband, who is strictly a meat and potatoes guy even pops them in his kisser. Question? Can I assume your local fishmonger is The Brewster – for the halibut? Thanks honey!! Yes it is indeed the Brewster, love that place. This sounds so delicious…it must make for me!